Fortunately wood is cheap enough, though the havoc made in the Bendigo forests will certainly clear the land. Keesing, N (ed) 1989, Gold fever: voices from Australian goldfields, Eden, North Ryde, N.S.W. Since European settlement, land clearing and deforestation have contributed to the issues of salinity, drought, erosion and global warming. 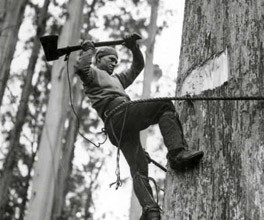 Until the 1950s, most timber was harvested manually, using axes and hand saws. Generally, only the trees that were wanted for timber were felled – this is known as selective logging. However, after the 1950s, there was an increase in mechanisation in the logging industry, and clear-felling became widely practised. The best logs were removed for processing, but nearly every other tree was bulldozed and burnt, leaving hectares of devastation. The arguments in favour of this were that it was efficient and it allowed the forest to regenerate. But the opposing arguments are just as valid. When a forest is clear-felled, the ground is greatly disturbed by heavy machinery, and there is nothing to bind the soil together. If rain falls on the disturbed ground, erosion can occur, and large amounts of sediment can wash into creeks and rivers. Another effect of clear-felling is that regenerated forests are basically a monoculture, meaning that they consist of only one main species of tree. As the forest grows, unwanted species are removed, leading to a loss of biodiversity. Native birds and animals also suffer from the loss of their habitat. Victoria's animal emblem, Leadbeaters's possum, is under threat of extinction because its habitat is still being logged. In the late 19th century, the European view of the Australian bush began to change. Once viewed as an alien wilderness, it began to be recognised as a thing of beauty, which needed to be preserved. But despite this increased appreciation of the environment, large-scale logging continued. Today, we still need timber, and an increasing amount is from pine plantations. But this is an introduced plant that has become an environmental weed in some areas. There are also an increasing number of native tree plantations, but there's a strong argument that this is too little, too late.